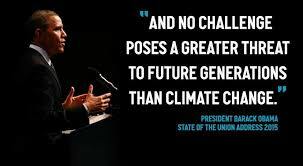 Climate Change Summit Being Used As Distraction By Obama. November 30th began the annual climate change summit hosted by the United Nations. This year’s conference will be held in Paris, France and will end on December 11th, 2015.The focus is to create legally binding and universal agreement on climate. Including reducing greenhouse gas emissions, produce “zero carbon, zero poverty”, and promote solar energy. The Obama Administration has been declaring for months that this is the absolute top priority. Nothing is as important as this conference. However, I find it difficult to imagine that only one thing can be the highest priority when it comes to U.S. citizens. With the controversy and division in America, there’s more than one climate that needs to be controlled. With the outburst of violence and rising crime rates, it’s difficult to believe there is no greater threat. While there is no doubt that climate change is important, the tendency of people to resort to violence is becoming alarming. Here at home, we see it repeatedly with the Black Lives Matter movement. Many cities have had their share of violence and unrest due to this idea of mob justice. There are issues just as important, that are a more immediate threat to the next generation. While crime rates rise, the Obama administration wants to lessen the ability of Law Enforcement to protect. Our own president and his administration needs to stop allowing non peaceful protests to flare up. They need to support the officers that go in these areas to keep innocents safe. With everything else going on, no one is honestly paying much attention to climate change. Many are overwhelmed with more immediate dangers closer to their own backyard. The New York Times looked into what the Paris meeting goals would do for the problem. A series of analyses showed that the best scenario from Paris would most likely cut emissions by only about half the level needed. That would leave a Paris deal as a step forward to solving climate change, but not the solution Obama has promised. The state of emergency has been in effect since the Nov. 13th terror attacks, which left over 150 victims dead. The protest took place on Place de la Republique, which has become a gathering place for Parisians since the terror attacks on Nov. 13. About 280 people had been arrested during the protests, according to French police, who said the clashes resulted in no serious injuries. Vicksburg School Evacuated When Explosive Was Smuggled In A Students Backpack. 4 Comments on "Climate Change Summit Being Used As Distraction By Obama."